Amazon has officially unveiled two additional consumer tech devices that not only offer excellent functionality to the technology loving crowd, but instantly grow the Alexa-enabled product count as well. The online retailing behemoth has taken the opportunity to announce the Amazon Tap and Amazon Echo Dot, two new Alexa-powered devices that should have a huge appeal to the home automation crowd. 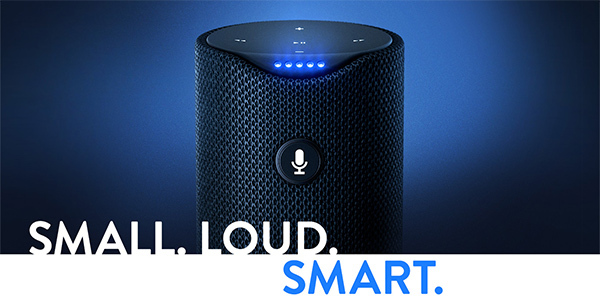 The two devices should also appeal to the technologically au fait who love controlling gadgets through audible commands, in this particular case, via Alexa. Both the new devices introduced capitalize on existing technology made perfect by the Amazon Echo, allowing Amazon to diversify its portfolio of Alexa-powered hardware. The newly introduced Amazon Tap is essentially a cut-cost, portable version of the unbelievably effective original Amazon Echo. Amazon’s goal to try and build a computer in the cloud that is essentially controlled by voice guidance was recognized with the release and development of the excellent Amazon Echo. 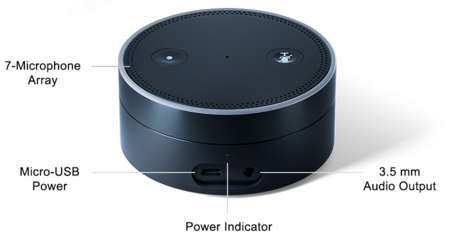 Amazon is clearly boasting about the successes of the original Echo, and has taken the opportunity to introduce a smaller, portable version with Bluetooth and Wi-Fi connectivity as well as built-in battery, essentially billing it as a portable wireless speaker with the power of Alexa that can be used on the go. The battery life is said to be 9 hours with continuous playback, and 3 weeks if left on standby. Tap comes with a cradle as well for charging it on the go. It also has dual-stereo speakers that give you crisp 360-degree omni-directional audio powered by Dolby, and weighs in at just 16.6 ounces. The biggest different between Tap and original Echo lies in how the voice assistant Alexa is triggered. 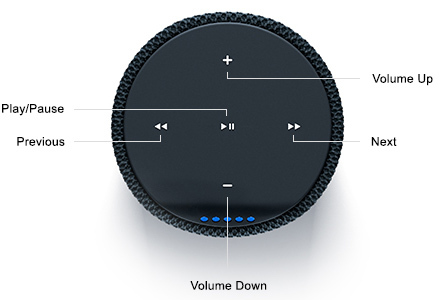 While on Amazon Echo you can trigger it by calling “Alexa” anytime, on Tap, this always-on “Alexa” voice trigger doesn’t work. Instead, a physical button on the front of the device must be pushed for it to listen to any voice commands. This is expected behavior as Tap is battery-powered. 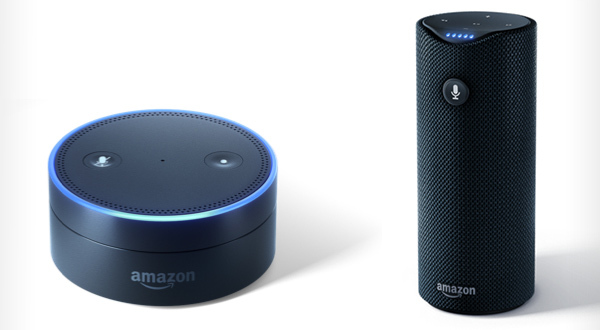 The Echo Dot on the other hand is being billed as the Echo’s much smaller sibling. 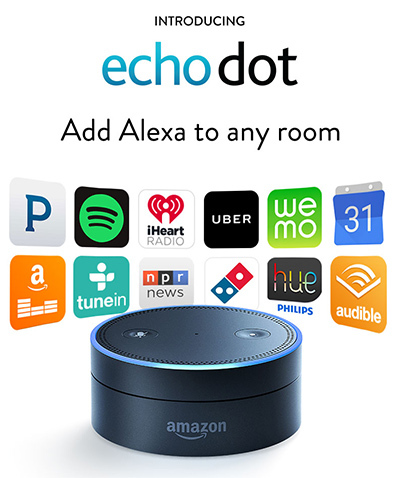 The Echo Dot costs a lot less than the full version of Echo as well as the portable version Tap, but manages to pack as much functionality and power into that cheaper price tag as possible. It carries the same far-field always-on “Alexa” voice recognition tech built-into the full version of Amazon Echo which allows it to understand audible commands even from 25-30 feet away. Like the Echo, the Echo Dot also sports a ring of light at the top which lights up when it has been interacted with. The tiny piece of intelligent gadgetry measures in at only 1.5-inches x 3.3-inches x 3.3-inches, and can also be connected to other speakers via the 3.5mm AUX port or bluetooth connection. With Echo Dot, Amazon’s main aim is to bring Alexa to just about any speaker system in your household. The portable battery-powered Amazon Tap is available to pre-order right now through Amazon for $130. Deliveries are expected to start from March 31st. That said, if the Amazon Echo Dot is something you’d prefer to get your hands on, then the options are slightly different. The product itself will cost a mere $90, but Amazon has stipulated that currently only Prime and original Echo or Fire TV users will be able to order it and that too by firing up Alexa on those devices and saying: “Alexa, order an Echo Dot”. Hopefully if you’re lucky, Alexa will then ask to pocket your $90 and issue you a new Echo Dot, but bear in mind that orders are limited to one unit per order and two units per customer.